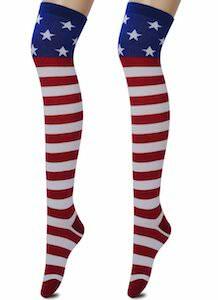 If you like some patriotic socks then you should check out these US flag knee high socks. The women’s flag socks are knee high with the part from the toes to the knees begin white and red striped and the knee part being blue with white stars on it. So now you can wear the US Stars and Stripes on your socks and you can wear these fun socks under your jeans or in summer under some fun shorts. The US flag socks are made from 60% cotton, 20% polyester, and 15% spandex.